NORTH BAY, Ont. – Mike Amadio registered his first three-goal game in the Ontario Hockey League to power the North Bay Battalion to a 4-3 victory Sunday over the Niagara IceDogs. Zach Bratina, who’s been white-hot of late, scored the other goal for the Battalion, while goaltender Jake Smith made 23 saves in earning his franchise-record 65th career win, eclipsing Bryan Pitton, before a Memorial Gardens crowd of 3,251. The Battalion, which dropped a 3-1 road decision Friday night to the Sudbury Wolves, ending a winning streak at four games, has a won-lost-extended record of 5-4-0 for 10 points, tied with the Barrie Colts for first place in the Central Division. Smith has a career record of 65-40-16 with eight shutouts, tied with Patrick Killeen for second place on the franchise list behind Matej Machovsky’s nine. 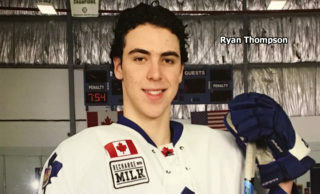 Overager Smith was a ninth-round pick in the 2011 OHL Priority Selection from the Oakville Rangers minor midgets. Jordan Maletta had one goal and one assist and Johnny Corneil and Anthony DiFruscia a goal apiece for Niagara. Goaltender Brent Moran faced 30 shots for the IceDogs, who defeated visiting Sudbury 3-1 Saturday night and are 3-6-1 for seven points, fourth in the division. 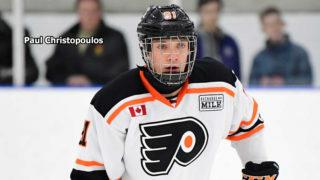 Amadio opened the scoring unassisted 14 seconds into the game, intercepting a weak pass by Ryan Mantha off the end boards that Mikkel Aagaard barely touched and converting past the surprised Moran. 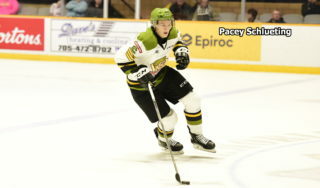 Corneil replied 30 seconds later when he fished the puck from the right-wing circle off a faceoff and, slipping toward the middle, snapped the disc past Smith before Amadio restored the Battalion lead at 2:28, beating Moran high to the glove side from the top of the left circle. 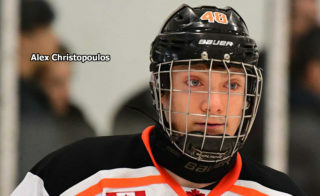 Bratina, who first eluded Blake Siebenaler just inside the blue line, weaved into the goalmouth and connected on the backhand at 5:51. It was Bratina’s team-leading 11th goal of the season, all scored in the last six games. He leads the Troops with 13 points in nine games. Maletta pulled Niagara within 3-2 at 1:35 of the second period, putting home his own rebound from the right lip of the crease, before Amadio collected his fourth goal of the season on the power play at 3:23. Amadio gloved down the puck, moved deep on the right wing and had his wrister sneak into the net for what proved to be the winning goal. DiFruscia scored from the slot with the man advantage at 19:06, converting a Josh Ho-Sang pass from the left-wing corner. Moran stoned penalty killer Bratina with the right pad on a feed from Amadio on a two-man breakaway after Max Kislinger went off for interference at 6:09, and Siebenaler hit the left post with the teams skating four a side in the 17th minute. Niagara outshot North Bay 10-3 in the third period in an effort to tie it up, but Smith was solid and the Battalion had the only power play, after Graham Knott was whistled for holding at 3:37. Moran left for an extra attacker with 1:05 to play, but the IceDogs failed to come close. 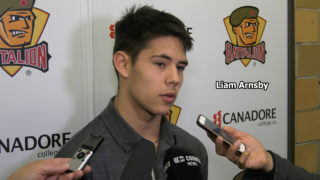 The Battalion hosts the Windsor Spitfires at 7 p.m. Thursday. BATTALION BULLETS: Host Ron MacLean of Rogers Hometown Hockey conducted the ceremonial faceoff and was interviewed on the video board in the first intermission before leaving to take part in other festivities in North Bay. Stan Butler, Battalion director of hockey operations and head coach, was to appear on the show Sunday night … Amadio surpassed current assistant coach Ryan Oulahen for 19th place in franchise scoring. In 204 career games, Amadio has 46 goals and 91 assists for 137 points, one more than Oulahen … The Battalion was 1-for-4 on the power play. Niagara went 1-for-2 … The Battalion, which dressed 17 skaters, one below the limit, scratched Austin Kosack, Kyle Wood, David Sherman, Jacob Ball, Brady Lyle and Calvin Gomes … Left winger Sherman, scratched after warmup at Sudbury, has a sports hernia and is to undergo surgery … Right winger Gomes, plagued by shoulder problems, was to leave for his Mississauga home Sunday night and in January will start studies at Toronto’s York University. 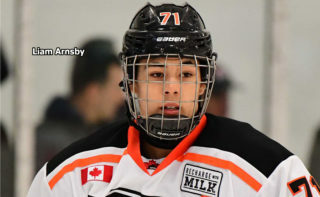 An eighth-round choice in the 2012 OHL Priority Selection from the North York Rangers minor midgets, he played a total of 21 games with Brampton and North Bay starting in 2012-13 without registering a point. Gomes, 19, missed all of last season and played four games this season.